Does your belly go wakoo-dokie at the sight of FOOD? Do you try escaping potato fries, pakoras and samosas that tempt your taste buds ONLY because of such huge quantity of oil? Well here we present before you, the solution – the KENSTAR Oxy Fryer fries your favourite food EVENLY without any oil and retains most of the nutrients inside. So, you can now enjoy your choicest dishes without heading to the guilt trip later. This is Kenstar Oxy Fryer Review. 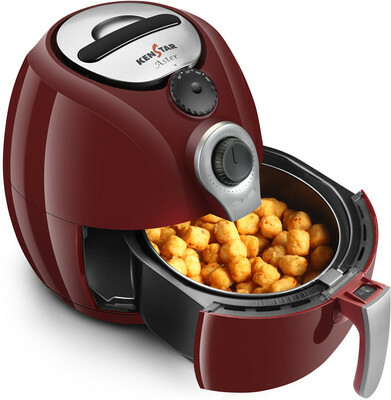 Basically, the Oxy Fryer uses air to fry your favorite snacks thus making the food healthier and also saves time as it prepares most of the delicacies within a few minutes. Talking about function, the Kenstar oxy fryer possesses a large capacity of 3 litres that would help you fry large portions of food with complete ease. IT has a timer ranging from 0 to 30 minutes provided with an auto-power cut function. The temperature scale ranges from 80 degree celcius to 200 degree celcius which is absolutely ideal as it enables you to cook various food items. What makes oxy fryer exclusive is the hidden handle which promotes ease of handling and a 1.2 metre length power cord which ensures convenient placement. Not to forget is an aesthetically designed outlet vent which would keep your kitchen odour free. This is Kenstar Oxy Fryer Review. The product is BEAUTIFULLY crafted and is compact. It comes with a manual and a 100 recipes guide book. Talking about the cost segment, it is available for rupees 7990 after providing a 6% discount on the actual price of 8500 rupees, which is a great price compared to similar products available in market today. Apart from this, Kenstar provides a 1 year warranty on this product. If I had to point out the flaws, there is ONLY ONE that is- a thin layer of OIL is surely needed for crispness in the food items. On the whole, the product is an absolute success and a MUST HAVE in your kitchen for those of you who LIVE for FOOD. This is Kenstar Oxy Fryer Review. ⅛ tsp salt This is Kenstar Oxy Fryer Review. Step 1: Take a small bowl and mix ginger-garlic paste, red chilli sauce, colour, salt and pepper together. Step 2: Pat dry the potato fingers with a kitchen towel. Step 3: Take these fingers in a dry bowl. Pour the above prepared mixture and mix to coat the potato fingers. Step 4: Preheat Oxy Fryer for 5 minutes at 160° C.
Arrange fingers in fry basket and close it properly. Keep the fryer at 160° C for 15-20 minutes. Step 5: Take a bowl and mix tomato ketchup, red chilli sauce, soya sauce, vinegar, sugar and pepper powder. Mix well. Step 6: Take a kadhai. Heat 1-2 tbsp oil in it. Add onion rings and fry till soft. Add ginger-garlic paste and the add capsicum rings. Cook such that it remains crunchy. Step 7: Add all the sauces, chilli flakes, ajino-moto, and pepper. Mix well and cook till the sauce gets a little cooked and dries up slightly. Step 8: Add potatoes in it. Mix. Add honey, spring onion greens and sesame seeds. Mix and cook for 2 more minutes.